Karen Brooks’ first historical novel, The Brewer’s Tale, charted the travails of a young woman who dared enter a traditional male profession in early 15th-century England, and the repercussions she faced. 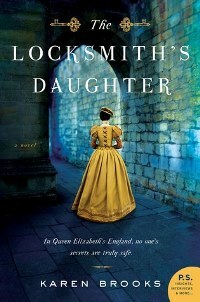 The Locksmith’s Daughter, the author’s follow-up novel, moves forward a century and a half to Elizabethan times. It follows the intrigue-filled life of Mallory Bright, another talented woman who finds herself in a profession reserved for men. Her role is more covert than that of Brooks’ earlier heroine, Anneke Sheldrake, but it proves to be equally treacherous. The setting is 1580s London, which Brooks richly evokes through her descriptions of clothing and architecture as well as the characters’ period vocabulary. There are many phrases recognizable from Shakespeare (“Go to,” for instance) and others compelling enough to invite re-use today (“cupshotten,” meaning drunk). The taut political intrigue of the times is ever-present, too. The religious tolerance of Queen Elizabeth’s earlier reign, her statement against making “windows into men’s souls,” has begun to evaporate in the face of Catholic threats against her realm. No one pursues these perceived traitors as fervently as Sir Francis Walsingham, Her Majesty’s principal secretary and spymaster. Mallory gets drawn into Walsingham’s network because of a scandal in her recent past. Having just returned to her father’s home after a traumatic would-be elopement, Mallory pretends to be a widow to avoid public rebuke. (On this note, it’s curious to hear others call her “Mistress Mallory” rather than her supposed married name.) Although she was given a good education and learned lock-picking at her father’s knee, her unfortunate romantic decision means she’s now a burden and embarrassment to her parents. Only Caleb, an actor who lodges with their family, seems supportive and understanding. When her father’s old friend Walsingham comes to test her skills and offers her an opportunity to work for him secretly, she knows it’s the only way forward for her future. Brooks makes Mallory’s circumstances relatable; at first, she soaks up Walsingham’s praise for her accomplishments. However, when she sees Catholics rounded up for doing nothing more than worshipping differently, and the impact later hits far closer to home, she develops ambivalence and then doubt about her role. As the mysteries from Mallory’s past are slowly revealed, the plot spins into a propulsive, sometimes over-the-top thriller that moves from Walsingham’s lair on Seething Lane (a great and historically accurate name) to the grim Tower of London, and into the company of a lanky nobleman who sailed with Francis Drake and has his own demons to fight. The book’s length may seem intimidating, but it moves fast. It conveys an overall message of tolerance while maintaining the atmosphere of multi-cultural Tudor London and providing a mini-lesson on the intricate art of lock-picking. 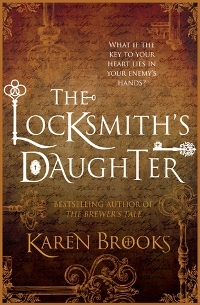 The Locksmith's Daughter was recently published in the US by Morrow, but was previously published in the author's home country of Australia by Harlequin (who had provided me access via NetGalley in 2016; my apologies for the delayed appearance of this review).